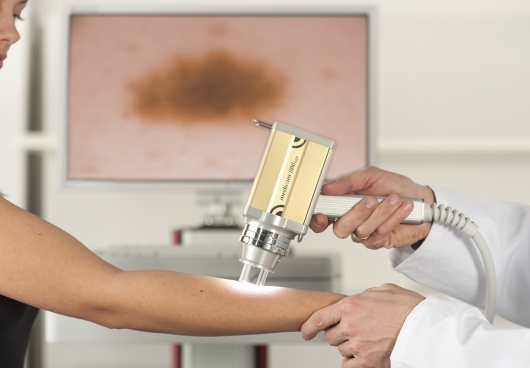 FotoFinder dermoscope offers all in one, dermatoscopic skin cancer screening and mole mapping, making it the imaging system of choice by thousands of dermatologists and skin cancer doctors worldwide. The system automatically links digital dermatoscopic images of moles to an overview image, making the identification and tracking of lesions easy. Through on-screen comparison of overview and microscopic mole images at follow-up visits, diagnostic accuracy can be significantly increased as even the slightest changes in mole structure are visualized and melanoma in situ and melanomas that do not satisfy the classical clinical features of melanoma are easier detected, examined and identified for surgery. Total body mapping has become a “must do” procedure for monitoring high-risk patients with a personal or familial history of melanoma or dysplastic nevi syndrome. The most reliable way to detect new moles is a periodic side-by-side comparison of baseline and follow-up photos. 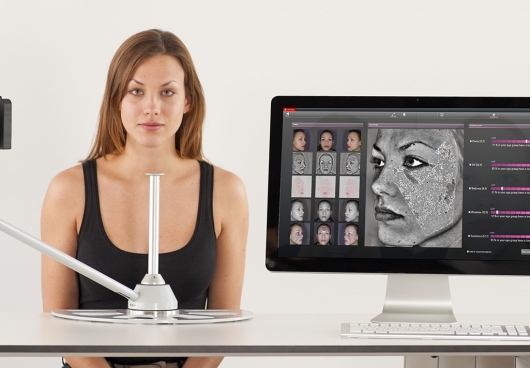 With FotoFinder bodystudio total body mapping can be performed in only a few minutes. The system displays on-screen the body area to be photographed and the corresponding patient pose. The laptop and camera are in permanent connection offering an optimized imaging workflow where the software takes control of the entire imaging process. Captured images are displayed immediately on-screen and directly stored in the patient database. 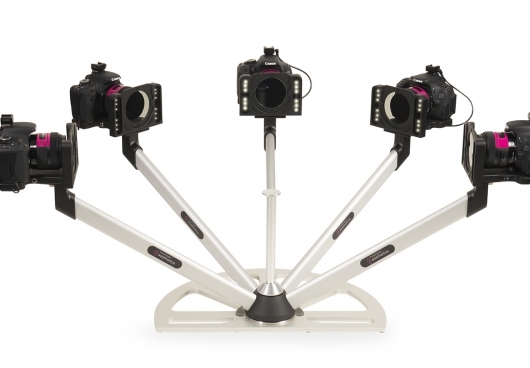 The camera slides up and down the stand for fast and consistent photography of all body areas. 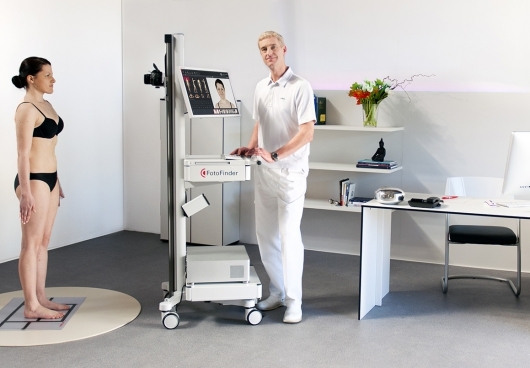 The bodystudio cart features the unique Laser Liner for consistent patient positioning at baseline and follow-ups: The laser displays a red line on the floor to show the patient where to position. It also assures consistent distance between camera and patient, even when you move the system from room to room. Total body mapping cannot get any easier. 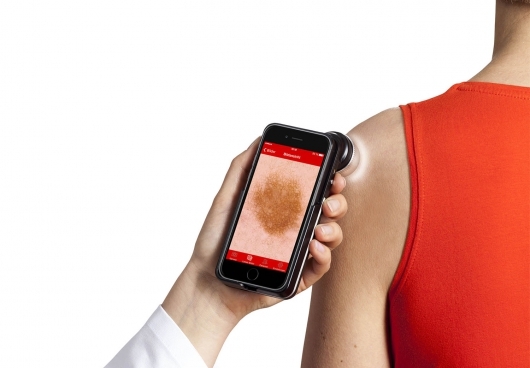 Launching handyscope in 2010, FotoFinder was the first to combine smartphone technology with a sophisticated tool for skin cancer screening. 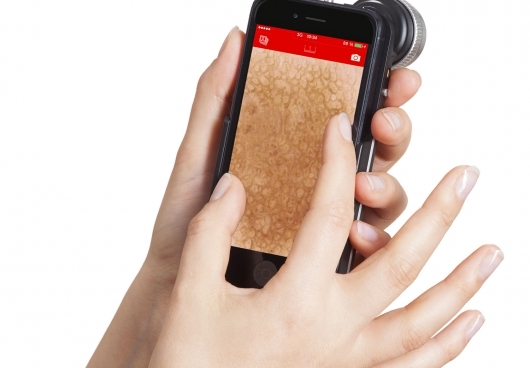 Handyscope converts either your iPod Touch or iPhone 4, 5 and 6 into a digital dermatoscope. It allows you to take brilliant polarized and non-polarized mole pictures of up to 20X magnification. Then you save them in the password protected app. 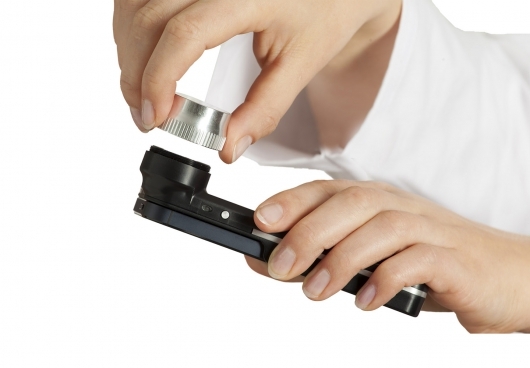 Thus handyscope lifts handheld dermatoscopy to a new quality level. 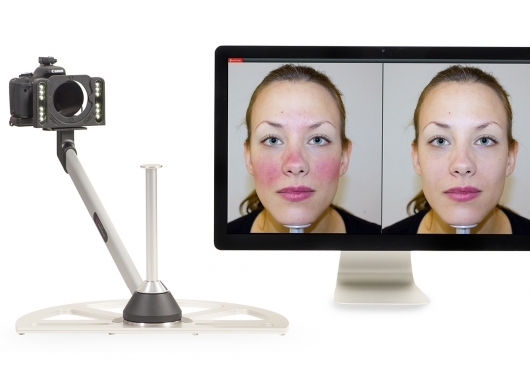 A revolution in dermatoscopy! With its twin light mode, great optics and ergonomic use, the new handyscope offers a degree of handiness that is unsurpassed in digital dermatoscopy. Compact and lightweight, it offers the advantages of polarized and immersion fluid dermatoscopy all in one beautiful piece of technology designed and made in Germany. Enjoy the convenience of examining moles on the iPhone screen without the hassles of a conventional dermatoscope. Keep your distance during the skin exam and easily evaluate moles on-screen or show the result to your patient. The smart alternative to conventional handheld dermatoscopes. 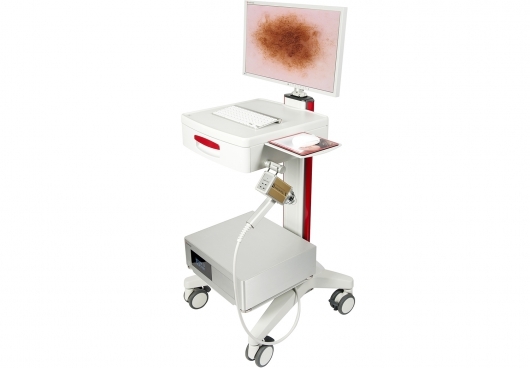 FotoFinder invented eDermoscopy, combining handyscope with the cloud-like FotoFinder Hub web database with extended features for image management and analysis. FotoFinder Hub also provides a unique second opinion service so that handyscope gives you direct access to the best diagnostic quality worldwide. Consistent photo documentation is a ‘must have’ for aesthetic and cosmetic procedures. FotoFinder aesthetics is the proven, world wide tool for medical treatment photo documentation of any kind. Whether you perform face lifts, laser treatments, fillers, liposuction, body contouring, vein therapies or any other procedure; FotoFinder’s outstanding images demonstrate the success of your treatments and impress your patients with customized Rejuvenation Plans, Sun Damage and Procedure Reports. FotoFinder aesthetics offers optimized imaging workflow; where the laptop and camera are in permanent connection. The CamControl feature offers pre-set camera profiles for facial, décolleté and abdomen photos; taking control of the entire imaging process. The captured images are displayed immediately on-screen and directly stored in the patient database. No mistakes, no confusion with images; photo documentation has never been easier. 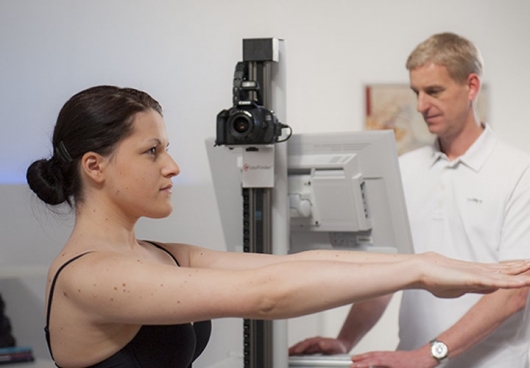 For follow-ups, FotoFinder’s Ghost Feature displays the baseline photo in the background of the live image and assists the provider in achieving consistent patient-positioning. Outstanding before and after photos are guaranteed every time by any user.